Q: I love to experiment with my hair but in between working and looking after the kids I just don’t have the time to colour it every few weeks. Is there a way to spread out my dye sessions? A: If you’re hot on your hair colour trends you’ll know that ombré is the hottest technique this season, and the great news is that it’s really low maintenance. 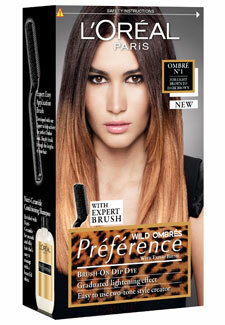 Also known as dip dye and root stretch, the mid-lengths and ends of the hair are lightened so the roots appear drawn out. Because the ends are coloured, you can leave your hair to simply grow out. If you have greys, all you need to do is dye roots every few weeks, rather than your whole head. If you can’t afford a trip to the salon, try the new L’Oreal Preference Wild Ombrés Dip Dye hair colour, £6.99, to mimic the technique at home. With celebrities like Kate Beckinsale, Jessica Alba and SJP all opting for ombré, you’ll be in good company!